Last week in 2018 the year 5&6 camp we had camp at wednesday to friday. We had six activity each day. First we did skate/skoder/basketball/ping pong. We were practising skating around the hall. question: How many people were at your camp including teachers? My blog https://odslukea.blogspot.co.nz/ Thank you. Hi, my name is Andre from Owairaka District School I can't wait to go to my School Camp. Was there much land at the Camp? Hi,my name is Lujain. I'm from Owairaka School, that looks like its pretty fun... I have a question, how long did you guys stay there? Talofa Lava. Welcome to my blog. 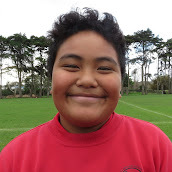 My name is Lealofi I‘m a year six in Room 7 at Pt England School. My teacher is Mr Goodwin. My favourite sport is touch, because in tackle rugby you get hit hard to the ground.